Ductility is the measure of the extent to which a material will deform before fracture . More ductile material can easily drawn into thin wires . It is ability to deform under tensile load. (malleability is the property to deform under compressive load into thin sheets). Ductile material is weakest in shear so design engineer mainly concern shear failure in ductile material .example of ductile material is Al ,Mild Steel , Cu, Silver ,gold etc. Lead is highly malleable but not highly ductile. Platinum is most ductile and gold is most malleable material. Brittle material fails suddenly without any indication of yielding. Brittle material are strong in compression moderate in shear and weak in tension. In concrete tensile tensile strength is 8 to 14% of its compressive strength . Tungsten is brittle at room temperature and ductile at elevated temperature. 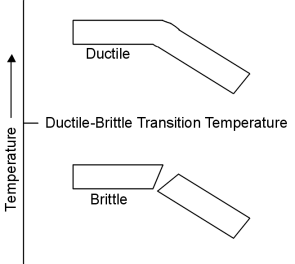 brittle material transition into ductile material . By decreasing the temperature transition of ductile material into brittle material.